Hawaii Consolidated Railway Company Ltd. In 1960, a star was added, representing Hawaii, bringing the total number of stars on the U.S. flag to 50. There are thirteen stripes representing the thirteen original colonies. white, red, and the border being in the proportion of 3, 2, 1, respectively. There is one difference between the regulations of 8 April 1896, and those in current use. The 1896 regulations call for a fimbriation to the Cross of St George of 1/6 the cross, whereas the modern ones ask for 1/3. Both sets call for "the arms of the red cross with border to be equal in width to one of the horizontal stripes", and whilst I interpreted the original to include the border and therefore, a total width of 1/8 the flag, I (along with FOTW and the official website) now interpret it to mean that the width of the red cross only should be 1/8 and the fimbriation extra (since to include a 1/3 fimbriation in the 1/8 would make an impossibly narrow cross and saltire. The image above is drawn to the appropriate official specifications with the Union Jack canton being 7/16 the length of the flag. This makes the proportions of the UJ 4:7, which is unusual but not entirely uncommon. A more standard version of how manufacturers actually make Hawaii's flag is shown below. I have at least one of each of the U.S. standard sizes in my collection, and to a flag, all of the cantons are quartered. I also have three 3x6 foot Hawaiian flags. One was made in the UK, one in Hong Kong, and one in Australia. All three have quartered cantons. I also have a couple of older Valley Forge Flag co. Hawaiian flags that were manufactured with cantons shorter that half length. Less than quartered UJ cantons built into Hawaiian flags proportionally less than 1:2 look really stumpy. This variant is a more standard version of how manufacturers actually make Hawaii's flag. I have at least one of each of the U.S. standard sizes in my collection, and to a flag, all of the cantons are quartered. I also have three 3x6 foot Hawaiian flags. One was made in the UK, one in Hong Kong, and one in Australia. All three have quartered cantons. I also have a couple of older Valley Forge Flag co. Hawaiian flags that were manufactured with cantons shorter that half length. Less than quartered UJ cantons built into Hawaiian flags proportionally less than 1:2 look really stumpy. Like most U.S. states with uniquely proportioned flags, Hawaii's government has accepted U.S. flag industry standards and also flies flags proportioned 2:3, 5:8 and 3:5 with quartered cantons. This is the flag of Hawaii according to a diagram issued by the Government of the Republic and dated 8 April 1896. The figures for the flag work out at 32-32 for the hoist, 56-72 for the fly and each stripe at 8, whilst the canton is 12-1-6-1-12 hoist, 24-1-6-1-24 fly, and the saltire at 1-2-3. As you will see this brings the fimbriated Cross of St George to exactly the same width as a stripe, with each blue panel being twice the width of the cross in height and in proportions of 1:2. According to NAVA news (January 1984) the flag of the governor of Hawaii is blue over red with the word "Hawaii" in white in the center and, around the word, 8 white stars (8 islands perhaps?). The name "HAWAII" reads correctly on both sides of the flag. 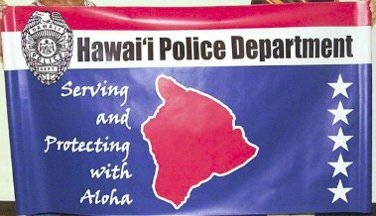 Horizontally banded, red, white, blue, ratio approximately 1-1-4, with the name in the white stripe, the badge in the upper hoist, a white-edged red map of the island of Hawai'i in the center, the motto to its hoist side, and five white stars vertically along the fly. Hawai'i is not the same as the State of Hawaii. It is one of the state's counties, and is coterminus with the "Big Island" of Hawaii. The state military crest, which is the crest used in the coats of arms of units of the National Guard, as granted by the precursor organizations of what is now the Army Institute of Heraldry. The official Institute of Heraldry blazon is "A dolphin embowed hauriant argent, in his mouth a key fesswise or." Anyone familiar with the traditional heraldic depiction of a dolphin--as on the arms of the French Dauphins or the famous colophon of the Venetian printer Aldus Manutius--will be able to see at a glance that this is not an anatomically correct dolphin, but it's a dolphin (the mammal), not a mahi-mahi (dolphinfish), the seafood delicacy. Neither does the creature on the crest and the U.S. Navy submariner's badge remotely resemble a mahi-mahi/dolphin-fish, which lacks the snout of the heraldic (and natural) dolphin and has a single long dorsal fin extending the length of its back. Statehood day seems to be set for the third Friday in August, despite official statehood of August 21.